Chess Pie is sometimes called vinegar pie because you put vinegar in the recipe. This is one of my favorite pies. If you have never made chess pie, you will love it. Chess Pie is perfect for any gathering as most people love it. Melt butter in microwave and set aside. Beat sugar, cornmeal and eggs in a bowl with mixer. Add buttermilk, vinegar and vanilla. With a spoon stir in melted butter. Pour into pie crust. Bake in a preheated 400 degree oven 40 minutes or until knife inserted in center comes out clean. Turn off oven and leave pie in oven until oven cools. Enjoy! If you like this recipe, you might also like my recipe for Buttermilk Pies. This classic Chess Pie is absolutely delicious! Melt butter in microwave and set aside. Beat sugar, cornmeal and eggs in a bowl with mixer. Add buttermilk, vinegar and vanilla. With a spoon stir in melted butter. Pour into pie crust. Bake in a preheated 400 degree oven 40 minutes or until knife inserted in center comes out clean. Turn off oven and leave pie in oven until oven cools. Chess pie brings back memories to me. When I was a little girl, 8 or 9 maybe, there was a local bakery in our town that made these in little tart pans. An older neighbor of ours used to buy me one once in a while when she’d go to the bakery. It was such a treat because I never had anything like that at home. 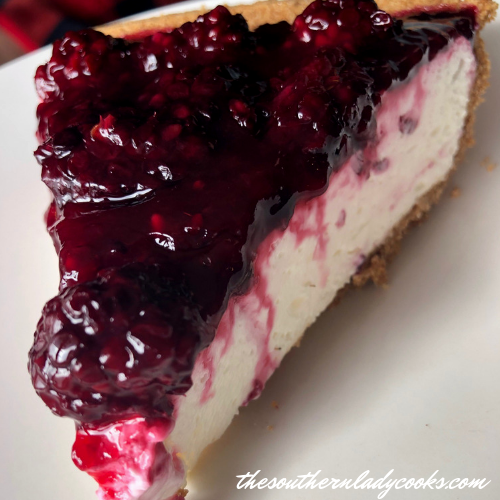 I absolutely loved them, but have never made one… But I think of her often, especially when over 70 years later, I see recipes for Chess Pies… Love your recipes and always look forward to see what you’re posting for recipes each day….. Keep it up! Thank you for the sweet message and what wonderful memories! You had a Chess pie on here about a year ago and it had pineapple in it. It was the best pie I ever made from your recipe. Do you still have it because I lost my recipe. Click on pies on the right hand side of any page on the website. It should be posted there. You can also use the search box on the site. Do you think this would work to divide evenly into two regular pie shells instead of deep dish? I don’t know if you would have enough filling for 2 regular pie shells. One might have less filling than the other but you could try it. Thank you Granny and Happy Mother’s Day to you, too. I think you could use a sugar substitute on the Chess Pie but I have not tried it. WONDER HOW THIS WOULD WORK WITH THAT ARTIFICAL SUGAR AS I CALL IT.I HAVE BEEN HAPPY SENCE I FOUND THAT AND STARTED TO USE IT.PUT IT ON CEREAL AND CUT UP FRUIT.I ALSO PUT 2 TEASPOONS FULL IN MY TEA NOW.SUGAR IS NOT GOOD FOR US.BUT THEN ONCE IN A WHILE IT OK.HAD TO CUTE BACK.I AM HUNGRY FOR THIS PIE AND WILL TRY IT. Its amazing with splenda! Don’t be afraid. Use it as you would sugar. I’m a diabetic so I don’t miss the sugar. Be brave…you’ll love it and no one will e er know! Promise! MY AUNT MANY YEARS AGO MADE THIS .USING THE VINEGAR YOU COOK WITH THESE REC LIKE I WAS RAISED.HAVE MOST OF THE ITEMS AT HOME TO COOK WITH.NO BOX MIXES ON THIS. So happy you all enjoyed this recipe. PLAIN CORNMEAL, I AM ASSUMING . . . I don’t think it would matter in this pie. I want to make this tonight and serve tomorrow night, can I just refrigerate and heat in microwave to serve? Yes I made two chess pies for today and they look just like the picture!!!! Lol my grandma best friend used to make the best chess pie. She is no longer with us, but I KNOW she is looking dosn from heaven with a big smile on her face. Will be making it again. How would you make third into chocolate chess pie? There is a chocolate chess pie posted on the website under Pies. I am making a double batch for two pies for Thanksgiving tomorrow. This is my first time making so cross your fingers for me! I’ve been searching for this recipe forever! I’m making it first thing tomorrow! Check the internet for how to use vinegar and milk to make buttermilk as a sub for the real thing. Just add a tablespoon full of plain vinegar or lemon juice per cup or so of milk, stir, & let set for a few minutes, then stir again. Voila! Is the pie shell cooked or uncooked when you pour in the filling? The pie shell is uncooked when you pour in the filling. can I use yellow corn meal since I have that or just buy the white? Yes, I think you can use yellow corn meal. I made this pie last night. I can honestly say, this is one of the most heavenly things I’ve ever put in my mouth. WOW! Thank you Pamela! I love this pie, too. Chess pie is definitely one of my very favorites. So happy you enjoyed this recipe and thank you for letting me know. I live in Canada now, but was born and raised in the South. I couldn’t believe there was something so incredible that I had never heard of and never tried. I was shocked at how good it was. Do you have a recipe for breakfast sausage gravy that is particularly good? Happy you enjoyed the pie, too. Thanks, all set for my next days off. My mouth is watering. In Canada these are called “Sugar Pies” they are easy to make and very good, but not calorie friendly. I have been making this Chess Pie for yrs and this is the recipe I use its the best cant go wrong its very simple to make and so easy to eat Thank you for sharing ……. When I was a child in Memphis my grandmama would make what I thought was CHEST pie. I used to wonder whose chest was in the pie? Today it is still one of my favorite pies. I just wish I could wrap my arms around your neck and hold on forever ! Your recipes remind me of my grandmas .So glad I found this site , and you. Thank you so much Laurie. So happy to have you on the site and happy you enjoy the recipes. can U make one without buttermilk? Linda, I have never made it without the buttermilk. It is a lot like Buttermilk Pie only it has vinegar and cornmeal in it and I would not substitute in a buttermilk pie. If you try it, let me know how it turns out. I always hear the story that a man asked a woman what sort of pie this was and she said j’es pie. And he heard chess. I still haven’t made one of these. Looks delicious. This recipe is absolutely one of the best for chess/vinegar pies. Been eating this “vinegar” pie all my life and is still my favorite. Have an awesome Labor Day!